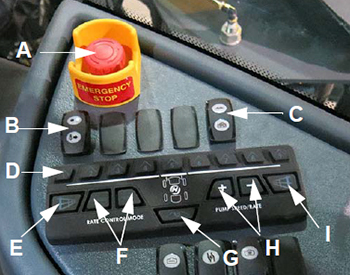 The e-stop switch provides a quick and positive method for stopping the engine in an emergency situation. 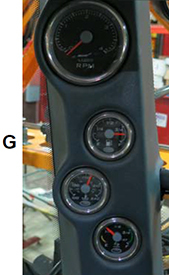 The pump speed/rate switches allow the user to increase or decrease flow rate through the spray system. 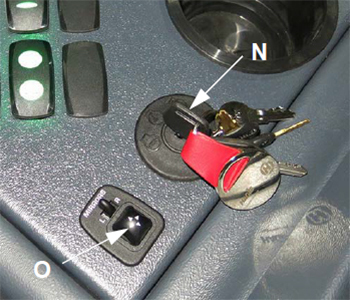 K Solution pump switch The solution pump switch is used to turn the solution pump on/off. 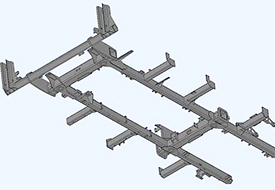 M Boom extension switches (left/right outer fold) The boom extension switches are used to extend or retract the outer boom extensions. 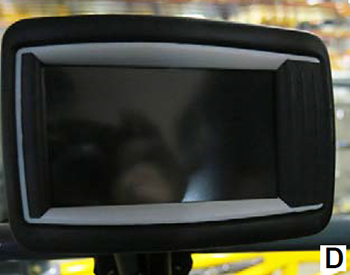 O Power mirror switch (if equipped) The power mirror switch allows adjustment of the electric side-view mirrors vertically or horizontally by pressing the switch in the desired position. 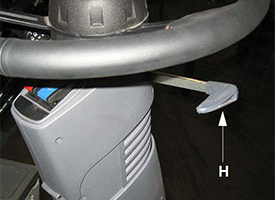 P Hydrostatic drive control handle The hydrostatic drive control handle controls the direction of the machine and the speed in which it travels. 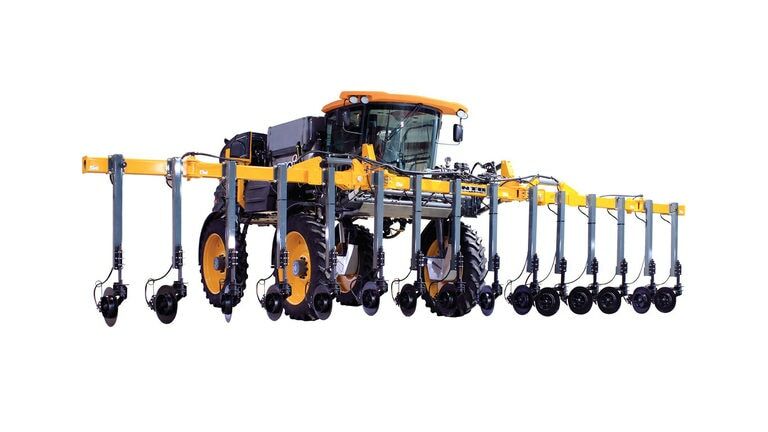 It is also used to control the spray booms, master spray, end row management, and shift up/down speeds. 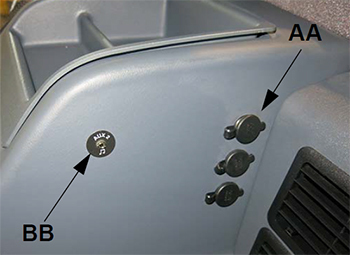 Q Transom switch (up/down) The transom switch is used to raise and lower the main lift. 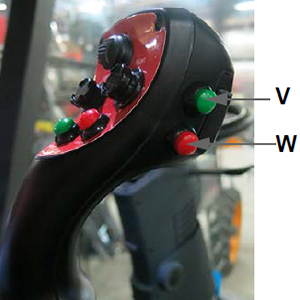 R Left-hand boom switch The left- and right-hand boom switches are used to raise, lower, extend, and retract the spray booms. 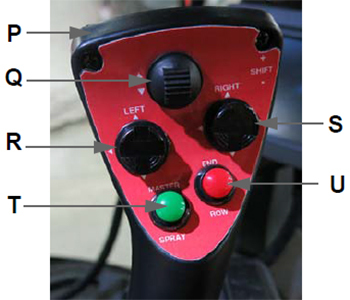 S Right-hand boom switch The left- and right-hand boom switches are used to raise, lower, extend, and retract the spray booms. T Master spray switch The master spray switch activates the boom solution valves. 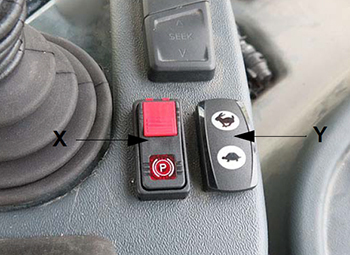 U End row management switch The end-row management switch is a programmable switch that enables various functions (i.e. 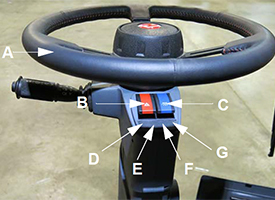 all-wheel steer, auto steer, master spray, and NORAC® system enable) when the switch is depressed. 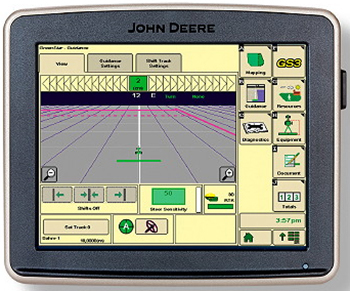 End-row management settings are programmed through the machine display. 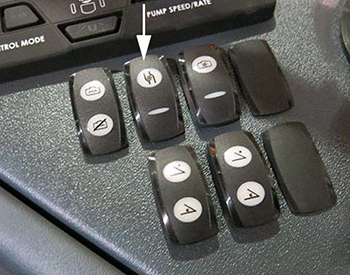 V Shift up switch The shift up/down switches are used for speed range selection. 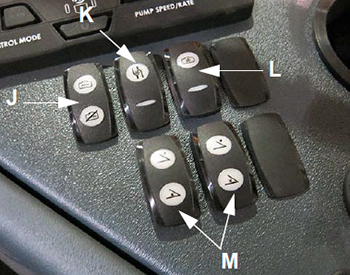 W Shift down switch The shift up/down switches are used for speed range selection. 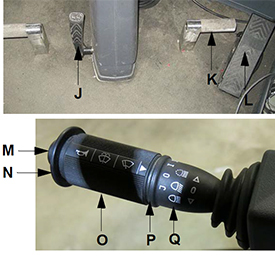 X Parking brake switch The parking brake switch is used to engage and disengage the parking brake, as well as extend and retract the ladder. 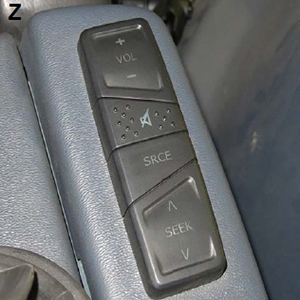 Y Throttle switch The throttle switch is used to control engine speed (rpm). Z Remote stereo controls The remote stereo controls are conveniently located to control the stereo (volume, mute, source, and seek). AA 12-V power ports Four power ports are provided for the connection of additional items (such as radios and computer equipment). BB Two auxiliary audio input connections The auxiliary audio input allows connection of a personal iPod® device or MP3 player. 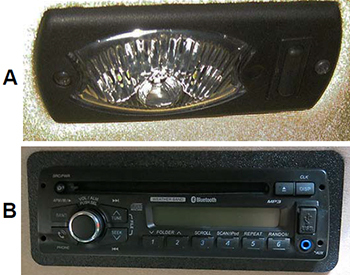 The stereo features an AM/FM tuner, weatherband broadcasting, CD player, MP3 player, USB/iPod device controls, and Bluetooth® wireless system (if equipped). iPod is a trademark of Apple, Inc. NORAC is a trademark of NORAC Systems International. Bluetooth is a trademark of Bluetooth SIG Incorporated. Viper is a trademark of Raven Industries Incorporated. 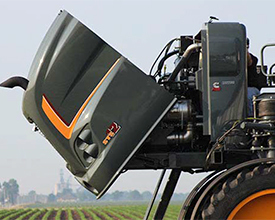 Ag Leader and InCommand are trademarks of Ag Leader Technology, Inc. 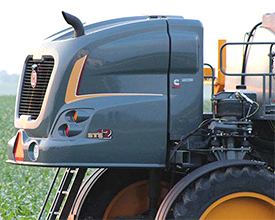 The Hagie STS Series is powered by a 6.7-L (408.9-cu in.) 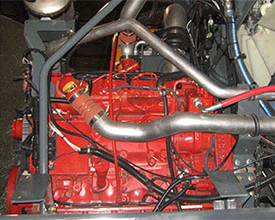 Cummins QSB diesel engine, which is offered in a 202-kW (275-hp) Tier 3 or the 220-kW (300-hp) emissions-compliant Final Tier 4 (FT4) configuration. The engine is electronic with an air-to-air cooler and turbo charger. The Tier 3 engine requires No. 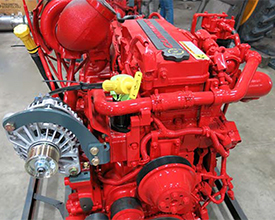 2 diesel fuel, and the FT4 engine requires ultra-low sulfur diesel (ULSD). Cummins is a trademark of Cummins Incorporated. 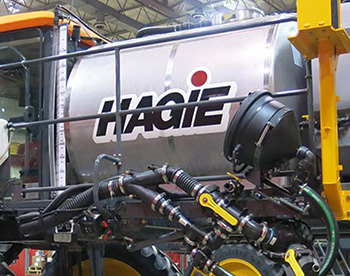 Hagie is a trademark of Hagie Manufacturing Company, LLC and similar to John Deere branded equipment, John Deere will also support Hagie equipment. 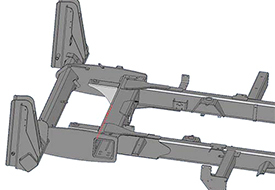 The STS Series mainframe design features horizontal cross-through axle tubes, as well as boom and platform mounts on weldment. 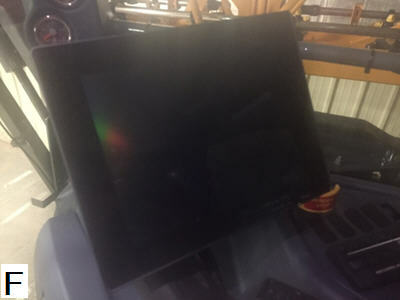 The solution system is a constantly monitored, continuously adjusted, computer-controlled system. 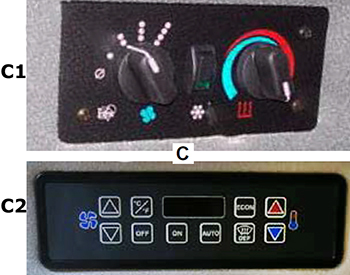 The cab-mounted digital spray system console receives information from various inputs to help determine L/ha (gpa) and L/min (gpm). 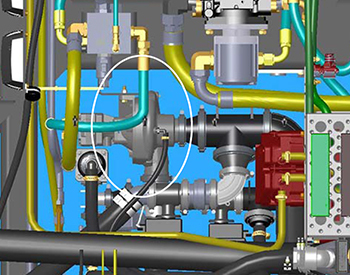 The Hypro® 9306C-HM1C-BU solution pump (located beneath center of machine) is a centrifugal-type, hydraulically-driven pump that is controlled by the solution pump control valve and the spray system console. 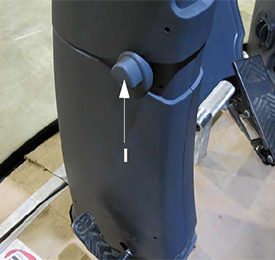 It comes with silicon-carbide seals, 7.6-cm (3-in.) inlet plumbing and 5.1-cm (2-in.) outlet plumbing. 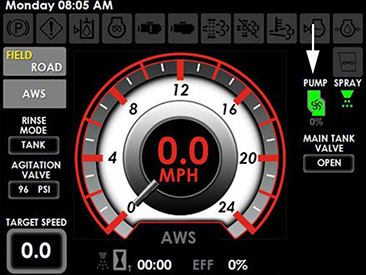 NOTE: When the solution pump is on, a solution pump indicator (located on the machine display home page - field mode) will be illuminated. Hypro is a trademark of Pentair Flow Technologies, LLC. 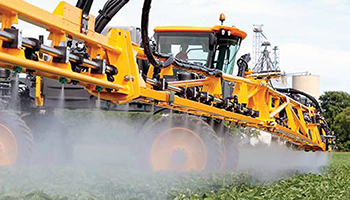 The spray booms are offered in a variety of configurations depending on the model and the producer's application needs.